CLR-SPC-111 is an RS232/485/422 to E1 converter that overcomes contradictions between traditional serial interface communication distance and communication rates. It also solves electromagnetic interference, ground ring interference and lightning damage problems. CLR-SPC-111 improves reliability, security and confidentiality of data communications. 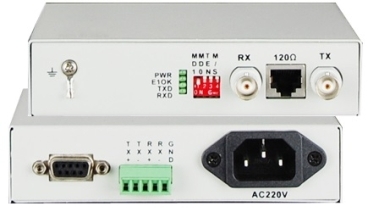 Two serial interfaces in different locations can be connected over an E1 (2Mbps) link which can be provided from an ISP transmission network. It is widely used for various industrial control, process control and traffic control systems, especially for banking, and power and other sectors and systems which have special need for electromagnetic interference-free environment. RS232/RS485/RS422 channel can transmit adaptable serial data asynchronously at 512kbps baud rate.